The transmission of noise and vibration associated with the close proximity of rail lines to houses and office buildings has become a significant issue in metropolitan areas. The operators of rail transit systems have begun turning to measures that mitigate noise and vibration and the complaints from city dwellers and business operators. Among vibration-mitigating measures, the so-called mass-spring-systems represent the most efficient method of reducing vibration directly at the source. Mass-spring-systems, which use soft steel coil springs in resiliently supported concrete track slabs, provide the lowest achievable system frequencies to attenuate vibration-related dB levels. The comparatively low depths of the concrete slabs allow for small tunnel diameters, simple installation, easy adjustment of the track level and low maintenance costs. Mass-spring-systems are used in tunnels, at grade and on elevated tracks on tram, metro, freight and high-speed lines. Noise has been shown to negatively impact a community’s quality of life. Noise-sensitive buildings, such as those that are dedicated to cultural and technical activities, are often affected by the transportation infrastructure. Railway noise and vibration from transit systems are on the rise due to increases in traffic, train speeds and axle loads. Norms and directives (such as the DIN 4150, ISO 2631, VDI 2057) provide limits for mechanical vibrations and structure-borne noise for buildings and people. These and similar standards are already enforced in many countries, and are increasingly referenced in specifications for construction or renovation of railway tracks. The sources and transmission paths of vibrations and structure-borne noise are complex and multifaceted. Methods to mitigate or eliminate vibrations and structure-borne noise are equally complex. They are usually grouped into either active (at the source) or passive (at the receiver) isolations. Active isolation is usually the more attractive solution, since vibration isolation that occurs at the source benefits all of the surrounding areas. This type of isolation can only be used, however, when new tracks or major track modifications are planned. Passive isolation is employed when a new building is constructed adjacent to an existing railroad (see Figure 2). In this case, the building is dynamically decoupled from the ground and thereby protected from ground-borne vibration. Solutions beyond improvements to rails and wheels, such as the elimination of rail corrugation or wheel flats, have been developed to mitigate vibration. A common solution is the use of resilient materials in rail fasteners, sleepers or ballast. Such measures can reduce noise transmission by 2 to 15 dB. Resilient materials are standard in slab track systems to provide elasticity that otherwise would be provided by the ballast. Higher isolation requirements, especially for concentrations in the excitation spectra below 80 Hz, often demand the use of mass-spring-system technology. Mass-Spring-Systems have been used for decades on all types of permanent way to effectively mitigate vibrations. Representing a special form of rigid slab track, they generally consist of a rail bearing plate or trough out of concrete that is placed on an elastic layer. The elastic material is often made of rubber, foam or steel coil springs. The material selection depends on the degree of isolation that is required or sometimes on the mass that can be used, due to construction restrictions. The cost of the isolation layer often limits the selection, as well. In order to provide a high level of attenuation, a mass-spring system requires an oscillating system. This consists of a mass, represented by the concrete slab or ballasted trough, that is supported by a resilient layer, represented by a spring (see Figures 3 and 4). The mass-spring-system can be simplified and sufficiently represented by a rigid mass system in which the concrete slab is considered a rigid body with negligible influence on the natural frequencies of the slab. Since the lowest natural bending frequency (of short and long slabs) is usually far beyond (or below) the theoretical support frequency of the system, transmission of the bending frequency through the spring is ruled out. Such a system with six degrees of freedom and six eigenfrequencies can further be simplified into a one degree-of-freedom model, as the excitation by the train is mainly in the vertical direction. Figure 5 shows the principle behavior of the simplified spring-mass model with excitation and inertia forces out of phase. The balance of the sum of all forces is one of the main principles of statics. A force always corresponds to a reaction force of the same magnitude. The same principle applies to dynamic analysis. Therefore, in order to reduce the reaction force generated by a dynamic excitation force, it is necessary to introduce an additional force that works opposite to the excitation force. A periodically excited acceleration of the mass generates this counteracting force. With an optimal choice of the system frequency, it is possible to achieve inertia forces that are very close to the relevant excitation forces that are generated by a train. The small difference in the forces left is still transmitted but can usually be neglected or even often not perceived. On the other hand, when both excitation and inertia force work in the same direction, the reaction force is actually increased, which yields a worsened effect. When both excitation and inertia force are in sync, the system is in resonance. The relevant excitation spectra relating to vibration and ground-borne noise generated by railway traffic is usually between 10Hz and 200Hz. Vibrations with frequencies above this range are dissipated rapidly by materials such as soil or concrete, which carry the waves. Since all oscillating systems have a resonance frequency, it is essential to set this frequency (= tuning frequency) outside the relevant excitation spectrum area. In general, the wide range of frequencies excited by railway systems suggests that the tuning frequency should be set as low as possible. It is important to have projected excitation spectra for the train when planning a mass-spring-system. The natural frequencies of neighboring buildings must also be considered in the design of the mass-spring system in order to prevent the occurrence of resonant vibrations that can disturb people or sensitive equipment. In the lower frequency range, natural frequencies of building slabs (depending on their design) usually range between 10 and 30 Hz, or lower. A mass-spring system with a tuning frequency that met a slab’s natural frequency would actually make the situation worse. As train excitation includes stochastic components, resonant building slab excitation may occur even if the excitation spectrum does not show low frequencies explicitly. • no reduction in elasticity in the dynamic range. • high vertical and horizontal load capability. • high attenuation levels also in the audible range. High-performance mass-spring systems incorporating steel coil springs with a tuning frequency between 5 and 9 Hz have been successfully used by trams, metro, heavy rail, freight and high-speed railways over the past 15 years. Mass-spring system designs (using several types of steel springs and spring elements) have been used in tunnels, above ground, and on bridges and viaducts, where mitigation of structure-borne noise and vibration is important. Construction and track-kinematical aspects are decisive in determining the mass and shape of the concrete slabs. 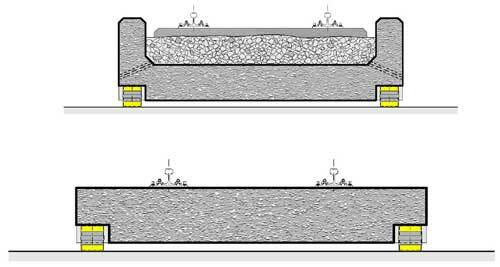 Optimization can result in a cost-saving reduction of the tunnel diameter and may represent the only option in a tunnel in which space is limited. Figure 6 shows the high transmission loss levels achieved by a 6.7-Hz system relative to the excitation frequencies. The curve measured on the test stand (left) confirms the theoretically produced curve (right), and illustrates the mitigating effect of a set of steel springs (outer and nested) when used in trackbed isolation. This approach is required to achieve high insertion loss levels, represented by mitigation of an initial structure-borne noise at a specified point in a propagation path by application of an elastic element (1). Insertion loss represents the actual dynamic efficiency of a mass-spring system by taking the contributions of the local parameters, such as soil conditions, lengths of transmission paths, structural masses and frequencies, etc. into account. Still, the opportunity to measure immission levels under same overall conditions with and without the use of a mass-spring system rarely occurs. However, the use of an elastic bearing system with a low natural frequency that provides high transmission loss levels ensures high attenuation over the entire relevant frequency range. Compared to a higher tuned system, there is a clear advantage in the lower frequency range of mechanical vibrations, and in the higher frequency acoustic range, as well (see Figure 6). Mass-spring systems are designed and custom-built to meet the specific requirements that are dictated by construction and train operation issues. They are tuned to obtain a defined immission reduction, depending on the application. When determining the cost of a mass-spring system, overall system costs, which include the pure spring material as well as construction and installation costs, must be considered. Overall system costs typically range between $1,500 and $4,000 (USD) or more per meter of track. Longevity and maintenance issues should also be taken into consideration.